Cupcakes 'n Daisies: Some of this, A little of that . . . . . .
Are you as happy about today being Friday as I am? I feel like I've been chasing my tail all week long, starting a dozen different things and finishing nothing. I'm ready for a fresh start, a fresh week, but not a fresh month. Where did January go? I will be so disappointed if I don't get at least one quilt project finished this month. First order of business.....Quilt Soup, the pattern/fabric company I blogged about yesterday, they posted pictures of their cheery booth at the quilt show AND they are giving away 24 fat quarters of their adorable fabric...hop on over and leave a comment, but if you win, you have to give me half. I'll take anything you don't like! Click Here and Good Luck! 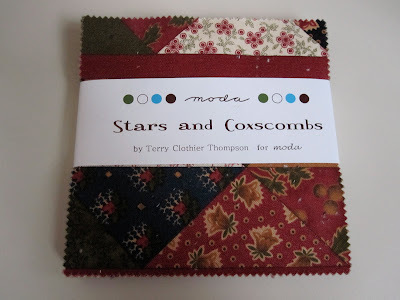 Well technically I picked up two of these little somethings, two charm packs of Stars and Coxcombs by Terry Clothier Thompson for Moda. Picking up some charm packs was on my "browse and buy" list. Those Schnibbles patterns are all about the charm packs, and since I've yet to make one of those patterns using a charm pack, I thought it would be a good idea to have some on hand, to be ready. Most of the charm packs at the show were lines I'd seen before, Rouenneries, Civil War Home Front, nothing new. Then I saw "Stars and Coxcombs". It was new to me, I thought, "this must be a line just out". Well after I got home, and looked closer at each fabric, I decided I really liked "Stars and Coxcombs" and needed more. I would call it a cross between "Kansas Troubles" and "Civil War Homefront". I searched my favorite shops for this fabric but got no hits. So I figured this fabric was so new it wasn't online yet. I then went to the Moda website to find out it was released November 2009! This is when I realized that my favorite online shops don't carry every Moda fabric line. I guess it was naive of me to expect them to, but that was my assumption. Lesson learned, check the Moda website monthly for new releases! Naturally, this story has a happy ending, I did find a quilt shop offering the fat quarter bundle of this family of fabrics AND it arrived yesterday! On a side note, this is my first fat quarter bundle, I thought the shops cut and packaged these things, but MODA does it! Who knew? At first I swore not to take off the plastic cover, but it caused a glare in the photo, so now I swear not to untie it. This pattern is "Elegant Garden" from Evelyn Sloppy's book, "40 Fabulous Quick-Cut Quilts". A marvelous book for all quilters. It's quilted with an all over loopy pattern and the back fabric has lovely tea cups and tea pots. I made this quilt in 2006, and it has all its points! I picture this quilt sitting in a sunroom over the arm of a white wicker sofa surrounded by hanging ferns....of which I have none. This is Quilt # 17, which I named Elegant Tea Garden, and it's 52" X 72". Just beautiful - like every other quilt you've shared. You keep me inspired! What a gorgeous quilt! Love your new fabric...I missed that one too! Beautiful! I too, find that I have to periodically check the Moda site for things that I may have missed! It's amazing what is out there... Also, some things are regional, so it does pay to search for what you like in places other than the "favorite shops." Congrats on a great find! ACK!! I adore the blue quilt. Oh that is so cheery, and I adore blues. It's funny how we forget that our shops can't actually carry everything. Though if you check out Fabric Shack they do seem to carry pretty much everything. i used that same tea pot fabric to represent my sister in my mother's 80th birthday quilt ... blue and white quilts are the bomb diggety. and i have one bundle of fat quarters to my name - i haven't taken the ribbon off it, either - sheesh - what's up with that? I missed Stars and Coxcombs, too. Beautiful - I can't wait to see what you do with it. Sweet quilt - I love it. I love your Elegant Tea Garden quilt! Beautiful! You know you can't untie those cute FQ bundles, right? Or as one of my quilt shop coworkers says, "Now it's a pet." Love your Elegant Tea Garden quilt. Gorgeous! I am like you I don't want to untie my bundles they are so pretty stacked up and tied! Thelma, TGIF. I am so glad it is Friday. Can't believe though that January is almost over. Thanks for pointing that out ;-) Love the charm quilt and fat quarter bundle you found. I have not seen that line of MODA. Maybe I should start checking their website as well. I love the blue quilt you shared today. So bright with the blues and white. Have a great weekend. That is a gorgeous quilt! Very cheery and Summery looking (which I could use after all the dreary weather we have had). I remember that blue and yellow tea cup fabric! In fact, I know I have some somewhere. I have always wanted to make a blue and yellow quilt, even though they are not my colors.